Matt Bolton serves as Executive Chef at the C restaurant + bar. Since October 2014, Bolton has overseen the entire kitchen operation and, as a hands-on executive chef, works alongside his team in the preparation of every dish. Bolton's inspiration derives from the abundance of fresh ingredients provided by local purveyors as well as from the bounty of seafood available off the spectacular Pacific Coast which the C restaurant overlooks. The C restaurant's menu of fresh, seasonal cuisine includes many of the special dishes that have become Bolton's signature offerings during his stellar culinary career. Bolton is strongly committed to the Monterey Bay Aquarium's Sustainable Seafood program, as reflected by his carefully chosen menus. In 2000, Bolton began working with notable Chef Cal Stamenov at Bernardus Lodge as Sous Chef for Marinus Restaurant. During his tenure, he learned the exacting techniques that are the foundation of great cuisine, as well as the value of impeccable, quality ingredients - philosophies that are at the heart of his cooking today. After almost 6 years of working under Chef Cal Stamenov, he would go on to acquire the reins at The Covey at Quail Lodge as Chef De Cuisine. 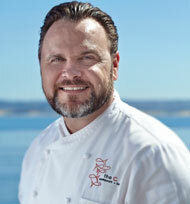 From there, he enjoyed the legendary coastal view as Executive Chef of Pacific's Edge at The Highlands Inn. Bolton's cuisine is a daily celebration of the Monterey Peninsula and spotlights the treasure trove of local fisherman, foragers and farmers. Sitting where land and sea literally collide, InterContinental The Clement Monterey emanates a coastal lifestyle and Bolton's cuisine at the C restaurant, C bar and the hotel's catering operations each exemplify this regional focus. The dining room offers scenic grandeur, in tandem with menus that weave the region's agricultural, viticultural, ranching and marine histories. In support of the sustainable seafood movement and neighboring Monterey Bay Aquarium, his menus are built around the products recommended by the National Seafood Guide. Bolton's approach to cooking is respectful, simple and certainly in-line with rustic, natural beauty of the surrounding landscape. From the James Beard House to The Chefs' Holidays at The Ahwahnee and Pebble Beach Food & Wine, cooking has given Matt Bolton the opportunity to support charitable efforts and community based organizations. His desire to support culinary education and youth opportunities brings his culinary training full circle.